Made of durable, rust-resistant material, the Winco BSOT-11 Solid Stainless Steel Basting Spoon, 11" will be a kitchen staff favorite. This sturdy, multi-purpose spoon is great for use with meat, poultry, vegetables and more. 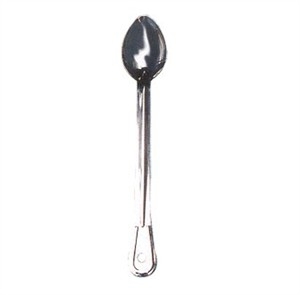 The spoon has a long, slim handle that distances your hand from the heat, and it features a hang hole for easy storage.